Scams in which criminals trick bank customers into paying them money out of their bank accounts jumped by 45% in the second half of last year. In the six months to December, £135m was transferred out of personal accounts to fraudsters with the customer's permission. In the first half of 2018, the total was £93m. 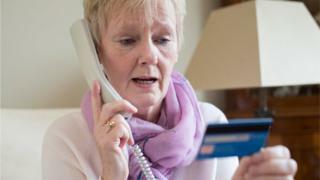 Over the whole of last year, more than 84,000 bank customers fell victim, some losing tens of thousands of pounds. Banks say scam merchants are shifting their attention from trying to penetrate banking systems to conning members of the public directly. Business are being targeted as well, with a similar sharp rise to £74m in suspicious transfers unwittingly authorised by staff members. Katy Worobec, who deals with economic crime at UK Finance, believes the most sinister examples are when fraudsters phone, email or arrive in person, claiming to be from the police or from the customer's bank. "We are seeing a shift away from some of the methods that fraudsters are using to try and attack banks' security systems to focusing on the person and duping them into making the payment themselves," she says.